The C100 and KPMG would like to zero in on the grassroots view of the Canadian founder experience of building a fast growth tech company and leveraging Silicon Valley. They need your insights and advice on best-practices to scale for growth. Their survey takes less than 15 minutes and you will be giving back to the next generation of your startup peers. To participate you have to be a Canadian Serial Tech Entrepreneur (founded/exited at least once) or your company has to have attended a past C100 48 Hours in the Valley or CEO Summit. Survey results to be launched in the fall on Techvibes and will provide important C100 programs input and advice. 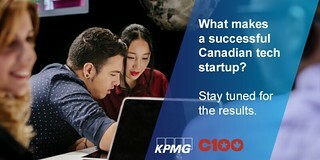 Participate today in the first C100 and KPMG Canadian Tech Entrepreneur Survey.